HENDRICKS COUNTY, Ind. 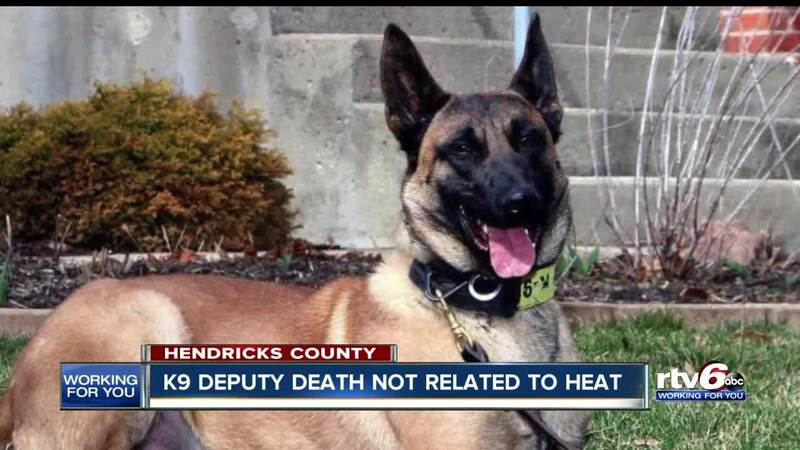 -- Tests have revealed that a Hendricks County K-9 Deputy that died after chasing a suspect earlier this month had a medical condition and did not die from heat-related issues as initially thought. K-9 Deputy Cade passed away on July 3rd, after a short career with the Hendricks County Sheriff’s Office. The sheriff’s office originally reported Cade had suffered symptoms “related to the extreme heat” while tracking a suspect near Brownsburg. He died a short time later. On July 16, the sheriff's office received the necropsy report from Purdue University which said Cade had actually died from a condition known as "GDV." The department went on to thank the community for the support they have given after the loss of their K-9 partner. A memorial service is planned for fallen K9 Deputy Cade. That service will be held Monday, July 23rd at 2 p.m. at the Bartlett Chapel United Methodist Church on E. Main Street in Avon and is open to the public. Doors will open at 1 p.m.